SAN ONOFRE STATE BEACH, CA – The warm spring weather in Wooster, OH has us dreaming of the beach rather than finals week. 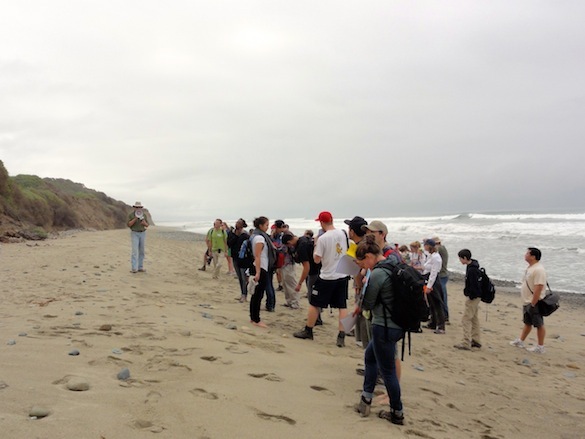 Some lucky Wooster Geologists had a recent beach fix when they visited San Onofre State Beach in southern California during the Keck Symposium. 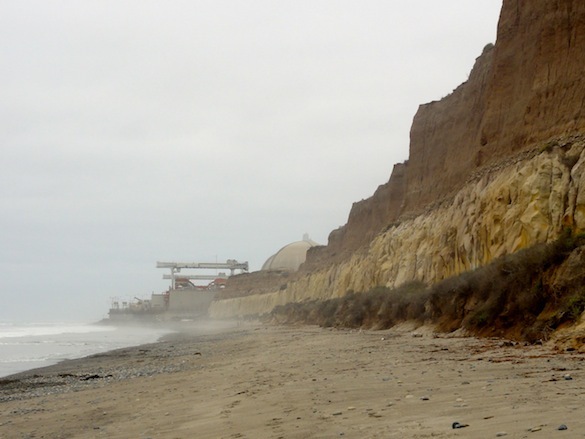 Symposium attendees had two options for the traditional Friday Field Trip: San Onofre Beach or Mecca Hills. It was a difficult choice, but the prospect of spending a warm day on the Pacific coast in April was quite persuasive for this midwest geologist. Keck Symposium participants at San Onofre Beach. 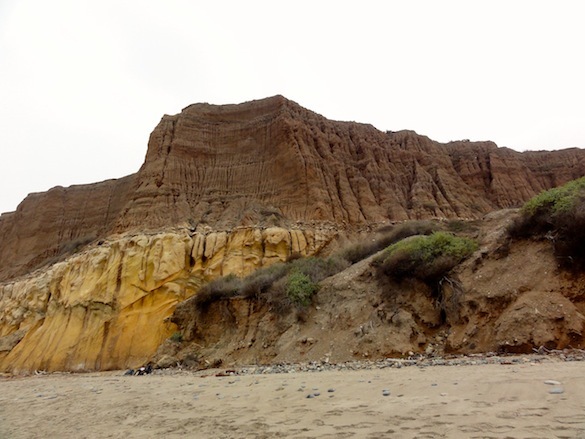 The fantastic cliffs along San Onofre Beach consist of the late Miocene San Mateo sandstone overlain by much younger alluvial sediments. Notice the bags on beach for scale. The San Mateo sandstone is a well-sorted marine unit with highly rounded grains that was likely deposited in a submarine fan setting. Although the sandstone itself is beautiful, what really caught our eye was the well-exposed Cristianitos Fault and associated deformation. 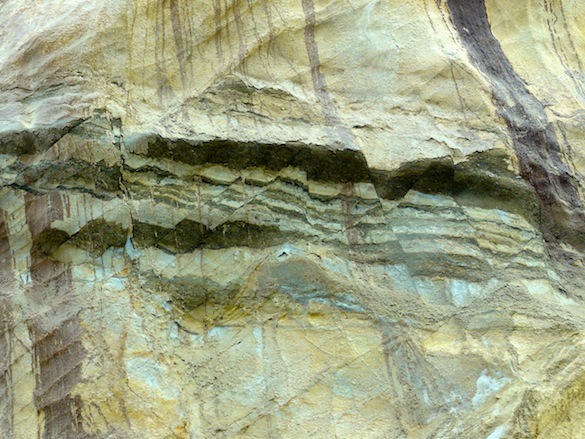 The San Mateo sandstone is riddled with textbook examples of deformation bands and faulting. Underlying the San Mateo sandstone is the mid Miocene Monterey Formation, a layered marine siltstone locally interbedded with volcanic ashes. Slumps occur in the Monterey Formation all along the coast. Tilted beds in a slump in the Monterey Formation. The white layer is a poorly lithified tuff. The width of the field of view is less than a meter. Much discussion was had about the stability of the nuclear power plant just up the beach, given the evidence for local faulting and mass wasting. Above the marine units is a thin, flat-lying cobble-rich layer. The cobbles were deposited on an ancient marine terrace ~125 ka. They littered the beach, so we had a chance to look at them up-close. What we observed were gorgeous hard-rock cobbles from the Cretaceous Catalina Blueschists and the Peninsular Ranges Batholith. The colorful blue cobbles are Catalina Blueschists and the salt and pepper cobbles are from the Peninsular Ranges Batholith. 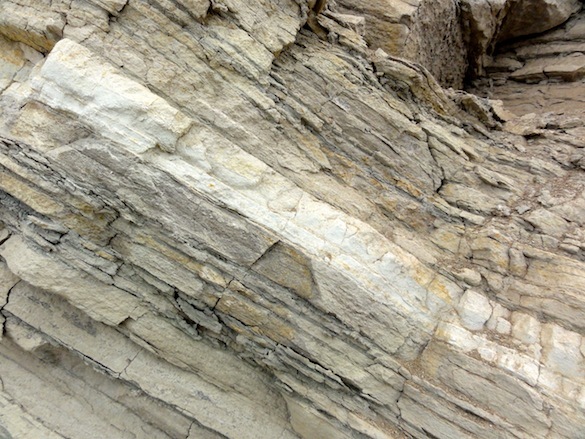 Beautiful sedimentary rocks … even though they are deformed! I remember this beach well from my childhood. I even had a tour of that nuclear power plant when I was a high school science student. That ~125 ka terrace, by the way, is from the same Eemian event Al Curran and I have been studying in the Bahamas. The engineering geologist in me both loves and is horrified by these pictures.